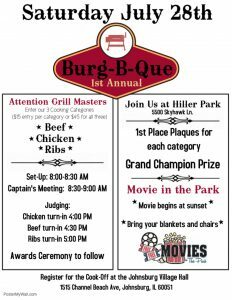 The village and the Community Affairs Committee will host the 1st Annual Burg-B-Que plus Movies in the Park on July 28 at Hiller Park, 5500 Skyhawk Lane. McHenry Township and the McHenry Township Road District were presented with a 2018 Recycling/Sustainability Award in recognition of McHenry Township’s recent Shred Day event. The award, presented by Lake in the Hills-based AMS Store and Shred, LLC, recognizes participants’ contributions of more than 11,600 pounds of documents collected for secure destruction during the Shred Day event. AMS will host another document shredding event from 9 a.m. to noon Oct. 6 at Lake in the Hills Village Hall, 600 Harvest Gate. For more information, call 815-385-5605 or visit www.mchenrytownship.com. The village announced that the Cary Police Department is currently accepting applications for the 2018 Citizen Police Academy. The class will meet from 6:30-8:30 p.m. on Wednesdays, beginning Sept. 29 and continuing through Nov. 28, at Cary Village Hall, 655 Village Hall Drive. The free program is available to persons living or working in Cary. Topics and demonstrations include firearms, patrol function, DUI, SWAT Team, drug and gang trends, use of force, investigations, the Coroner’s Office, K-9 Unit, tours of the police department and county jail, and a ride-along with a police officer. In addition, the class will hold a graduation ceremony at the Cary Village Board meeting on Dec. 4. Due to the limited number of class spaces, applications will be considered in the order they are received, and a background check is required for all applicants. Applications are available online (www.caryillinois.com) and are due by Aug. 31. Completed applications should be sent to: Village of Cary Police Department (Attn: Sergeant Chris Winklemann), 654 Village Hall Drive, Cary, Ill. 60013. For more information, contact Winklemann at 847-474-8045 or via email at cwinklemann@caryillinois.com — or visit www.caryillinois.com. 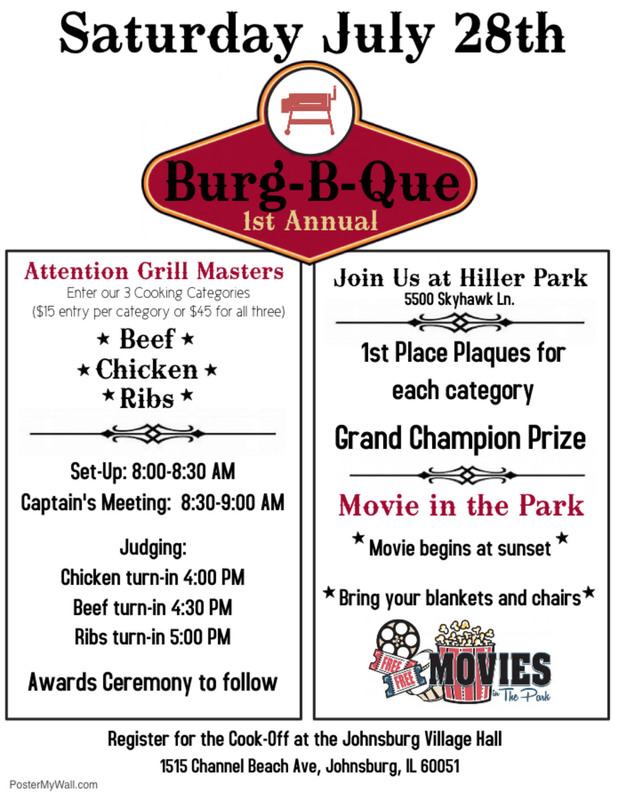 The village and the Community Affairs Committee will host the 1st Annual Burg-B-Que and Movies in the Park on July 28 at Hiller Park, 5500 Skyhawk Lane. The all-day event features a cook-off competition for local “grill masters” in three categories: beef, chicken and ribs. First-place plaques will be awarded in each category, and a Grand Champion will be announced as well. The entry fee is $15 per category or $45 for all three. Set-up is from 8-8:30 a.m., followed by a captain’s meeting from 8:30-9 a.m. Turn-in times for judging are 4 p.m. (chicken), 4:30 p.m. (beef) and 5 p.m. (ribs). Registration for the cook-off is available at Village Hall, 1515 Channel Beach Ave. Movies in the Park, featuring a showing of “The Love Bug” (rated G), will begin at sunset. Attendees are encouraged to bring blankets and chairs. Admission is free. For more information, call 815-385-6023 or visit www.johnsburg.org. The Woodstock Community Unit School District 200 Board of Education recently honored the winners of the district’s 2018 Spring Art Show. Hundreds of pieces of student artwork selected by teachers from the district’s 12 schools were on display from April 23 through May 8 at the Woodstock Public Library. Art teachers then selected one piece from each school as a winner. Each piece will be permanently displayed in the winning students’ schools. Superintendent Mike Moan also selected one piece to be displayed in the District 200 Administrative Services Center. The winners are Superintendent Award winner Emma Warren (grade 4), Prairiewood Elementary School; Sam Bockman (grade 11), Clay Academy; Melany Cervantes (grade 7), Creekside Middle School; Johanna Freeman (grade 7), Northwood Middle School; Alexis Johnson (grade 2), Mary Endres Elementary School; Jordan Lickfelt (grade 4), Olson Elementary School; Sophia Mendoza (grade 5), Westwood Elementary School; Paige Montanye (grade 1), Prairiewood Elementary School; Nathan Ryan (grade 11), Woodstock North High School; Madeline Scolio (grade 11), Woodstock High School; Leticia Vital (grade 4), Dean Elementary School; and Caiden Young (grade 4), Greenwood Elementary School. For more information, call 815-338-8200 or visit www.woodstockschools.org. The village announced that the Huntley Board of Trustees recently approved the 2018 Street Improvement Program, which includes improvements scheduled for the following streets in the Huntley Meadows subdivision: Preston Parkway, Madison Way, Fairbluff Avenue, Evendale Road, Main Street (Haligus to Central Park Boulevard), Braemer Parkway, Dawson Street, Casselberry South, Casselberry North and Auburn Court. The project will include grind and hot mix asphalt overlay on the identified streets, as well as spot repairs to the sidewalk, curb and gutter areas as needed. A construction project map is available for viewing at www.huntley.il.us. For more information, contact Jason Irvin, Assistant to the Director of Public Works and Engineering, at 847-515-5284 or via email at jirvin@huntley.il.us. The village announced that the Richmond-Spring Grove Chamber of Commerce will host the 13th Annual Charity Auto Show from 9 a.m. to 2 p.m. July 29 at the Scot Forge/Intermatic lawn and parking lot, located at the corner of Winn Road and Route 12. The event features an auto show, with people’s choice judging to award a Best of Show trophy and plaques for the top 20 autos. The registration fee is $5 per car, and the first 200 cars entered will receive a free dash plaque. All entries will be eligible for prizes. The event also includes free goodies bags for the first 200 attendees, a 50/50 cash raffle, on-site food service, vendor displays, music and more. Glass containers and alcoholic beverages are prohibited. Admission is free. For more information, call the Chamber at 815-403-5155 or visit www.rsgchamber.com.